BS EN 61439 – The New Standards are now implemented. Change brings opportunity. And this change is likely to affect most UK specifiers, panel builders and end users in the form of a brand new set of International Standards. Progressive companies will have already recognised the importance of its release and invested for a position of strength and growth. After more than 30 years without significant change, we have now been given a powerful set of new standards for electrical panels and switchboards. The exit of the previous BS EN 60439 standards makes way for an all new IEC (BS EN) 61439-2 document. This document has been completely re-written for improved safety and performance and to clearly define methods of assembly and type testing that may have previously been open to interpretation – particularly in the area of partially type tested assemblies and in acknowledging the need for flexibility within assembly designs and assemblies manufactured in quantity. Elsteel began preparing for the new standards as far back as 2010 and have for many years been awarded full certification for the Techno Module system. The company has undertaken this commitment to support the growing number of panel manufacturers opting for a fully tested modular assembly. Part 1: General Rules (generic types of assembly). Part 2: Power switchgear & control gear assemblies. Part 4: Assemblies for construction sites. Part 5: Assemblies for power distribution in public networks. Part 6: Busbar trunking systems. For anyone unfamiliar with the implications of the new standard, there are several significant changes to consider, most notably that Type Tested Assemblies (TTA) and Partially Type Tested Assemblies (PTTA) are to be removed and replaced with ‘Verified’ Power Switchgear & Control gear Assembly (PSC). Companies wishing to supply 61439 compliant panels have the option of testing their own designs or, as is increasingly the case, to use a pre-tested modular assembly. This allows them to claim Verification without having to invest in further testing or requiring an intimate knowledge of the Standard. The pre-tested modular assembly approach is embodied in Elsteel UK’s fully certified Techno Module. View all Certifications here. If you would like to learn more about the implications of the new standards and how Elsteel’s Techno Module meets these, we conduct IEC 61439 information seminars. Space Planning for Switch Rooms. Space Planning for Electrical Power Distribution and Control projects can be undertaken by Elsteel UK and TM Builder Network Partners during the early design stages to allow for adequate switch room sizing. 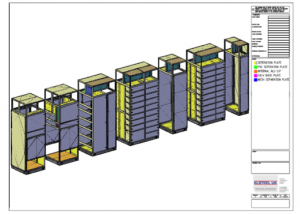 We do this by engaging with End Users, Engineering Teams, Consulting Engineers and Specifiers to discuss switchboard or MCC requirements, taking an Electrical Schematic and producing detailed CAD General Arrangement drawings showing accurate panel sizing. Your Projects Teams can then move forward with more detailed design, confident that switchgear space requirements can be met. can be found by linking to Elsteel’s global support website here.